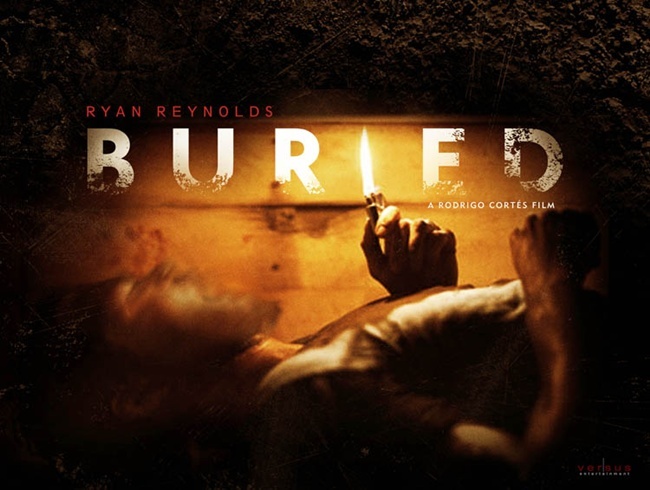 Buried is a high-concept film about a man who has been buried alive with only his cellphone, lighter, and a limited supply of oxygen. It stars a frequently mediocre, otherwise bad, actor in the lead (read: only) role, and is helmed by a new director. This movie is supposed to be bad; it is meant to make a profit off of its obviously slim budget. However, in spite of all of that, it defies expectations and gives one of the most thrilling endings of the year. Before we really see anything, we hear Paul Conroy (Ryan Reynolds from Waiting, The Proposal, Definitely, Maybe) panting as he awakes and gropes around for his lighter. The screen is pitch black–I imagine in a theater equally dark, this effect would be intense. As Paul flicks his lighter on and sees that he is in a wooden box, presumably buried six feet under, he (understandably) flips out. Fortunately, his cell phone rings, and he realizes that he has been left one form of contact to the outside world. As it turns out, the man calling him is the one who has taken him hostage. Paul works for a contractor that brings supplies to needy towns in a war-torn Iraq. His convoy was ambushed and most of his coworkers were killed. He was kept as a hostage, buried alive, so that no one could save him without delivering the demanded ransom. Paul manages to contact a friend, and through her gets numbers for all sorts of important hostage situation people to help him out. As they work for the US government, they of course cannot help him out, and he is forced to turn to a Blackwater-esque company, one that will negotiate with terrorists. They assure him that they are looking for him and those who have taken him hostage, but the terror and paranoia increase. Will they save him before he runs out of oxygen or his cell phone battery dies? The plot of the movie is left by the wayside early on. There is very little to defend in this movie. But, it still has some tricks up its sleeve by the end. The thing about bad movies is that they have two chances at redeeming themselves. The first is easy, and most-used: embrace how bad the movie is, and use that to cultivate how AWESOME it can be. This has been done by the likes of Piranha 3-D, Snakes on a Plane and many others. If only you can focus on a no-holds-barred orgiastic fest of awesomeness, you don’t need to worry about how bad the movie is, because you never wanted it to be good in the first place. The other way is difficult, and frequently leads to bad movies being even worse. If you attempt to make your film seem good by focusing on the few elements you can control, using those to elicit powerful reactions from your audience, you can sometimes leave them shaking in their boots. This is what Buried has done. Director and editor Rodrigo Cortes’ handiwork shows through in the editing, which is perhaps the strongest element of the film. They didn’t actually film inside a box, but the use of editing space creates the illusion that we too are inside the box. There is not a single shot in the film that takes place outside the box, and yet it flows together without ever missing a beat. Ryan Reynolds’ performance is the other strong element of this film; he naturally conveys an intense level of frustration coupled with futility that a better actor might have missed. He convinces us that he is just an average guy, stuck in a box. His attempts to get someone to listen to him on the phone are something we can all relate to–only for him, hanging up isn’t an option. The film had plenty of scenes that were contrived, scenes that I hated with a passion. One scene in particular, in which the tension built to a grand crescendo only to completely disappoint, made me want to turn it off right then. But at the next scene, the films pulls you right back into caring, or at least wanting to get out of that box yourself. Ultimately it is a bad movie, though. It will be forgotten and dismissed by the world in spite of its good characteristics, and it lacks any memorable lines to keep its cult status going. But if you want to see a movie that truly manages to keep you on the edge of your seat in spite of itself, rent this one. For as bad a film as it is, it surprised me with how good it was. This entry was posted in Reviews and tagged Buried, Ryan Reynolds. Bookmark the permalink.